since I first heard the song by that title. Darin Peterson, one of Scott's teachers at Immanuel High School, recorded the song by Geoff Moore on a collection of songs he compiled to comfort us in our loss. The song speaks to what really matters in life; what will be remembered ~ when all is said and done. About five years ago I participated in a two-year program on leadership being offered at my church. The final assignment was to write a Personal Mandate ~ a capstone for our twenty-four months of training. In writing my Personal Mandate, I had to ask some serious questions. How will I choose to live? Why will I live the life I am living? What will be my legacy ~ how will I be remembered? Quite honestly, I moaned and complained about this project. It totally stretched me to break down my life into a statement of purpose, articulate my core beliefs and create the strategies to achieve a desired legacy. I remember that for me, the best way to accomplish the task, was to start at the end and work backwards. So I began with the question in that Geoff Moore song ~ what will be said about my time here on earth, when all is said and done? I have to admit, in the end, I loved writing my Personal Mandate. I find it to be a solid rock on which I balance in my life, and determine how to invest my time and energies in those things that conform to my God-given purpose for living. That brings me to this week. Through the wonders of technology, I was able to be present for the funeral of Todd MacDonnell, a former pastor from our church. Although his memorial service was held in the small community of Pierz, Minnesota, I was able to participate in the service from our local church sanctuary via a Skype connection. Todd was just 48 years old. Eleven short weeks ago he went to the eye doctor for a sudden change in his vision. As glasses did not help, and other symptoms surfaced, Todd was sent to the Mayo Clinic in Rochester, MN. There he was diagnosed with Creutzfeldt–Jakob disease. No known cause. No known treatment. No known cure. 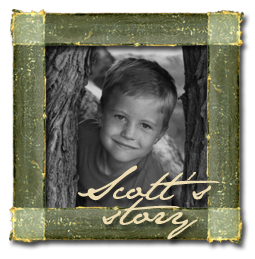 Todd's health declined dramatically, and he went to be with the Lord in less than 3 months. At his memorial service, speaker after speaker stood to read some of the thousands of notes and letters which were sent to Todd during his brief battle with CJD. Again and again, each writer spoke of how Todd had been instrumental in helping them become who they are today. Each commented on the consistent and faithful way Todd lived out his faith ~ never wavering, even with his impending death. And so this morning, I am thanking my friend, Todd MacDonnell, that in life and in death, he continues to urge us on to greater things, for eternity's sake. With my Personal Mandate in front of me, I am once again focusing on the importance of leaving a godly legacy ~ when all is said and done. It is never too late to redeem the future and leave a legacy that will continue to speak, when you have nothing left to say. NOTE: For information on how to write a Personal Mandate, please leave a comment with your contact information, and I will share the process with you. In "Legacy", "Life Choices", "Redeem", "Todd MacDonnell"
I have a friend whom I have known for about 50 years.
. Then, as newlyweds, she and her husband were sponsors in my high school youth group at church. ~ staying active, enjoying traveling, appreciating art ~ and still in love after all these years. So it came as quite a shock this past spring, when her husband was diagnosed with a tumor ~ a large malignant tumor near his kidney and in close proximity to his aorta ~ that remains inoperable. As a healthy man, he experienced no discomfort, no signs that these cancerous cells were growing inside of him. If he had not gone in for a routine physical, they had no reason to suspect the presence of the tumor. is that the tumor did not shrink enough. He is scheduled to begin radiation treatments in a little while. My friend keeps an online journal of their journey with cancer. One of her entries this week truly made me stop and think ~ how well am I? Here is a summary of her entry . . . It is almost hard to remember the days when he felt the effects of chemo; to recall how hard it was during those endless days and nights. He feels so normal now. We almost forget that he still has a malignant tumor in his body. There is no pain, no sign of it that he can feel or know, or be reminded that it is there. These last eight months that we have been on this journey have been experienced because the doctor told him he had a problem. He never knew ~ and still would not know simply by how he feels ~ that he has a tumor which will kill him. This is really rather stunning when you think about it. How can there be something deadly in one’s body and have no idea it is there? But it is still there, lurking in the dark, waiting for us to forget; to leave it alone so it can grow back and take over ~ how sinister! It reminds me of how attitudes and thoughts can take over in our spiritual lives ~ small or big, quietly yet deadly ~ growing . . . hoping to take over our minds and hearts if we are not watchful and prayerful about how we live and breathe, always asking God to show us those areas where we need His care and healing to remove them, to make our spiritual health intact, to live and grow in Him and bring glory to Him through our life. Her words reach deep within my soul! ~ in every fiber of our being. His Spirit scans our mind, our heart and our soul, and reveals the thoughts and attitudes that seek to destroy our peace with God, our relationships, and ultimately, our very purpose for living. if we are willing to face these silent malignancies that hold us back from the abundant life he truly desires us to live. Jesus also knew wellness was going to cost this man. The invalid would no longer be carried everywhere; no longer have food brought to him. A well man would need to accept responsibility for his life.
. . . acknowledge there may an area of the heart ~ a silent malignancy ~ which needs to be restored. and drove to Bethel Home, in neighboring Selma. , and rest in the hope of a reunion in eternity. Then, in 2003, my dad humbled himself and came home. Literally. He came to live with us. He met his great-grandchildren for the first time, ate pot roast and gravy like Mom used to make, and listened to Amy's husband, Jeff (whom he had never met) play hymns on the piano. He lived with us for about one year before suffering a stroke which took him at the age of 94 years old. ~ to renew the relationships lost with his family, confess to God and to us the hurts of the past 10 years, and finish well. The thought I have today, February 25th, is a powerful one. It is never too late to redeem the future. Tell Mom and Scott hello. Remember . . . It is never too late to redeem the future and finish well. I could not say it clearly, so my dad's parents became Grandpa and Grandma Goodie. The name stuck and when our children came along, my parents inherited those loving names. In "Life Choices", "Reconcile", "Redeem"
is a well-known Christmas carol composed in 1847 to accompany a French poem about the night of Jesus's birth. Although our English version is not a direct translation of the French poem, it communicates to me the significance of this night. For most families around the world, Christmas Eve is a night of anticipation. For children, it means falling to sleep and waking up to see what gifts await them. For parents, it often means a long night of assembling those "easy to assemble" toys for our children, and awaiting their shouts of joy. For many, it is traditionally the night we celebrate our Savior's birth. "strength for today and bright hope for tomorrow." O Holy Night, when "Christ Jesus, who, though he was in the form of God, did not count equality with God a thing to be grasped, but made himself nothing, taking the form of servant, being born in the likeness of men. And being found in human form, he humbled himself by becoming obedient to the point of death, even death on a cross." O Holy Night, when our Savior came to the world that lay in sin and error pining, to bring the promise of a future with Him. O Holy Night, when my soul felt its worth. Many centuries ago in the land of Egypt there lived a Pharaoh who had strange dreams. One night this Pharaoh dreamt he was sitting on the shore of the Nile River. Suddenly, a herd of seven plump, attractive cows came out of the water and began to eat the lush grassy reeds along the banks. Then, another herd of seven cows came out of the Nile. But these seven cows were thin, very ugly and poorly fed, not at all like the first seven cows. To Pharaoh’s surprise, these skinny cows did not begin eating the lush grassy reeds. They walked feebly over to the seven plump cows and DEVOURED all seven of them! When Pharaoh awoke, he was disturbed by this dream. He called for his magicians and wise men, but they could not interpret his dream. Then he called for a young Hebrew man named Joseph. Joseph, with wisdom from God, explained to Pharaoh that the cows in his dream represented years. The plump and attractive cows stood for seven good years of plenty and pleasure. The seven thin and ugly cows symbolized seven bad years of want and hunger. Joseph explained that the ending of this dream indicated that the seven needy years would be so terrible that when they came, it would be difficult to remember the seven years of plenty. You may be thinking, "Why is Bonnie sharing about “Seven Cows?" I think of Pharaoh’s dream often . . . especially at Thanksgiving. I’m asking God to bring to mind the “plump years” in my life. I want to recall God's faithfulness. I want to remember His promises. I want to redeem the future. Most of all, I want to glorify Him and draw others into His Kingdom as they see a joyful heart of thanksgiving and praise. not devour your fat years.